Dosa is the fermented batter pancake originated in Southern India. There are many varieties of dosa such as plain dosa, set dosa, paper dosa, MLA dosa, cheese dosa, mushroom dosa etc., my favorite is masala dosa. Just one dosa is enough to fill your stomach. I used to have dosa when ever I was hungry outside. My botany professor used to say, since dosa is fermented it contains very minute quantities of alcohol. That is the reason why you feel drowsy when you have dosa's. So, my dear students do not have dosa before your exam. coming to recipe. If you are planning for dosa tomorrow you should prepare batter today. Take urad dal, chana dal, methi seeds and rice in a bowl together and wash them. Soak atleast for 6hrs. After soaking grind them to fine paste with little water. Do not add more water be careful while grinding. Now take the batter in a vessel close the lid and let it say overnight. Place the plate below the vessel, when the batter gets fermented it may overflow. If you place plate beneath it the batter can be collected and used. Next day add little salt and mix well. Add water if required, check for the consistency of the batter, it shouldn't be too thick. If you take spoon full batter and drop from top it should fall continuously. Now the batter is ready we will see the masala preparation. Boil potato, peal skin and cut it to medium size pieces. Now take a pan and heat 2tbsp of oil and add cumin and mustard seeds, allow them to splatter.Add onions and saute until they turn transparent. Then add turmeric powder, salt, green chili and garlic paste and cook for 2min under medium flame. To this mixture add boiled and diced potato and mix well. You can even add batani/green peas or carrots etc., to this recipe. No wthe masala curry is ready. Heat pan and take laddle full of dosa batter and pour it on the center of the pan and spread it with the laddle by rotationg clockwise/anti clockwise until the batter is spread through out the pan and thickness remains same through out. For masala dosa the thickness should be medium. 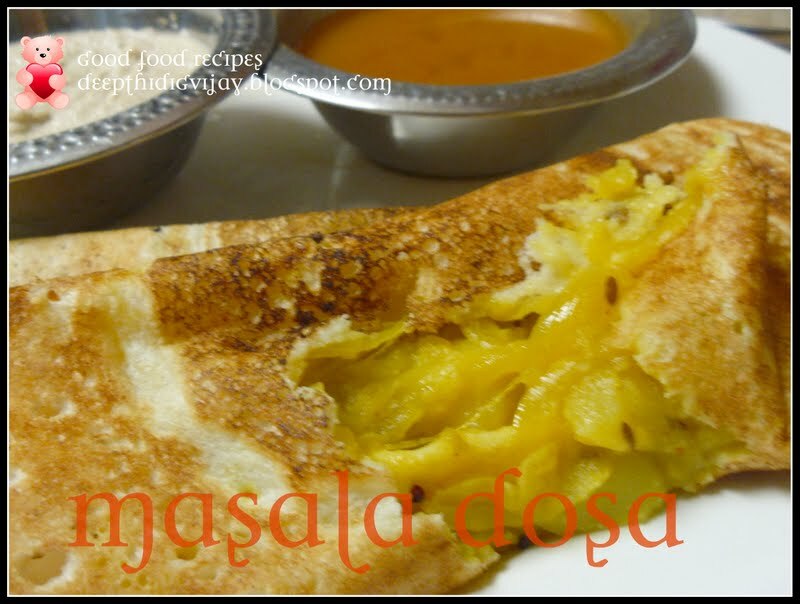 Scope out 1 spoon full of masala curry and add it at the center of dosa. Now close the pan with lid and let it cook till it attains nice brown color.them take from the pan and enjoy hot with little ghee on top, sambar and coconut/tomato chutney. This is my all time fav :-) I need to make this soon! 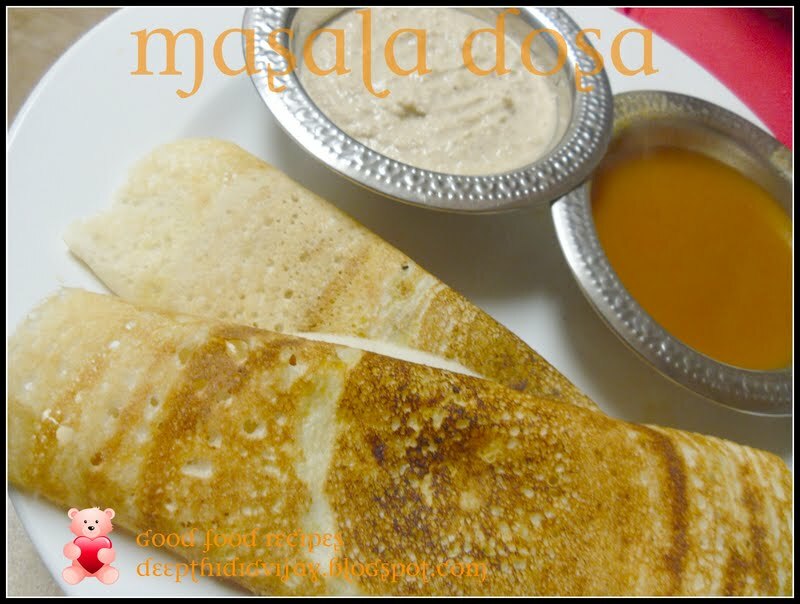 These dosas look very tempting...I am hungry now.. Brilliant ! Lovely looking masala dosa. Making me hungry. Hmmm.. perfect breakfast dish. I can have this anytime of the day. My favorite..Sounds perfect, crispy and yummy!